It must have been an awe-inspiring scene. As Jesus breathed His last breath, surrendered His spirit, and pronounced that it was finished, the world was shaken. There was suddenly a powerful earthquake causing the veil in the temple to be torn in two. As this happened, many who had died in grace came back to life appearing in physical form to many. As our Blessed Mother gazed upon her dead Son, she would have been shaken to her very core. As the Earth shook the dead to life, our Blessed Mother would have been immediately aware of the effect of her Son’s perfect Sacrifice. It was truly finished. Death was destroyed. The veil separating fallen humanity from the Father was destroyed. Heaven and Earth were now reunited and new life was immediately offered to those holy souls who were resting in their tombs. The veil in the temple was thick. It separated the Holy of Holies from the rest of the sanctuary. Only once a year was the high priest allowed to enter this holy place to offer an expiatory sacrifice to God for the sins of the people. So why was the veil torn? Because the entire world had now become a sanctuary, a new Holy of Holies. Jesus was the one and perfect Lamb of Sacrifice replacing the many animal sacrifices offered in the temple. What was local now became universal. Repetitive animal sacrifices offered by man to God became one sacrifice of God for man. Thus did the meaning of the temple migrate and find a home in the sanctuary of every Catholic Church. The Holy of Holies became obsolete by becoming common. The meaning of Jesus’ Sacrifice being offered on Mount Calvary for all to see is also significant. Public executions were performed to undo the public harm the executed supposedly caused. But Christ’s execution became an invitation for all to discover the new Holy of Holies. No longer was the high priest alone allowed to enter sacred space. Instead, all were invited to approach the Sacrifice of the Spotless Lamb. Even more, we are invited into the Holy of Holies in order to unite our own lives to that of the Lamb of God. As our Blessed Mother stood before the Cross of her Son and watched Him die, she would have been the first to fully unite her whole being to the Lamb of Sacrifice. She would have accepted His invitation to enter into the new Holy of Holies with her Son to adore her Son. She would have allowed her Son, the Eternal High Priest, to unite her to His Cross and offer her to the Father. Reflect, today, upon the glorious truth that the new Holy of Holies is all around you. Daily, you are invited to climb upon the Cross of the Lamb of God to offer your life to the Father. Such a perfect offering will be received gladly by God the Father. Like all holy souls, you are invited to rise from the tomb of your sin and proclaim the glory of God in deed and in word. 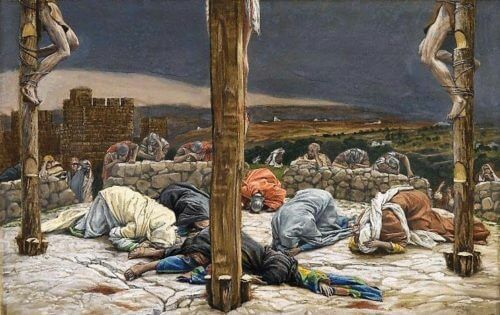 Reflect upon this glorious scene and rejoice that you are invited into the new Holy of Holies. My dearest Mother, you were the first to go behind the veil and share in the Sacrifice of your Son. As High Priest, He made the perfect atonement for all sin. Though you were sinless, you offered your life to the Father with your Son. My loving Mother, pray for me that I may become one with the Sacrifice of your Son. Pray that I may go beyond the veil of my sin and allow your divine Son, the Great High Priest, to offer me to the Father in Heaven. My glorious High Priest and Lamb of Sacrifice, I thank You for inviting me to gaze upon the sacrificial offering of Your life. Invite me, I pray, into Your glorious Sacrifice so that I may become an oblation of love offered with You to the Father.